Chef Nicole Brisson of Carnevino took the stage to cook up a cigar-lover's breakfast. "Who smoked more cigars yesterday than they ever have before?" asked David Savona, executive editor of Cigar Aficionado, as he addressed the Big Smoke crowd last Sunday morning. It was a question to which many hands were raised in response. He then probed, "Now, whose ready to smoke more?" This time, all hands went up. It was the final morning of the 2015 Big Smoke Las Vegas, and after a weekend jam-packed with more cigars than most could even fathom, our attendees were ready to rally for one more day of fun. But first, a hearty breakfast was in order. And fortunately chef Nicole Brisson of Carnevino was on hand with just the right remedy. "This breakfast calls for strong flavor because we've been smoking all weekend and our palates are probably a little numb," said Brisson, as she took the stage to whip up a delicious breakfast. The dish consisted of house-made fennel sausage and cheddar farmhouse tart inside a puff pastry, served with scrambled eggs and a mixed green salad. Guests sipped coffee and enjoyed an assortment of breads and pastries as Brisson walked them through the process: slowly caramelizing the onions, seasoning the dish with rosemary, sage and thyme, adding toasted walnuts and grated cheese to the puff pastry before layering it on top of the ingredients and adding a coating of egg wash to give it that crispy, golden-brown appearance. As Brisson prepared the food, she told us a little about herself. She was born in upstate New York, but most of her formal training was done in Italy, where she studied under world-renowned butcher, Dario Cecchini. Although she is only in her early-thirties, Brisson had experience working all over Italy before coming to Las Vegas where she worked at several of the city's acclaimed restaurants before becoming executive chef at Carnevino. Owned by Mario Batali and Joe Bastianichs' B&B Hospitality Group, Carnevino is an Italian steakhouse considered among the most celebrated restaurants in Las Vegas. Nicole Brisson, executive chef at Carnevino steakhouse in Las Vegas. However, it isn't just her accolades as a chef that qualifies Brisson to serve up breakfast for the more than 500 cigar smokers in attendance, she is also a lover of the leaf herself. "Cigars do pair well with food," she told the crowd. Although smoking was prohibited while the meal was being served, Brisson remarked that she has tried the Alec Bradley Tempus Nicaragua, which was offered to the guests as an after-breakfast cigar, and agreed that it paired nicely with the meal. As breakfast was served, Chef Brisson opened up the floor for a Q&A, to which attendees were very enthusiastic. Brisson fielded questions for nearly half an hour, responding to a range of inquiries about skillets, onions, gluton-free pastries and finding good eggs (look for organic brown eggs at the grocery store or farmers' market). She even offered a few tips on cooking turkey for the upcoming Thanksgiving holiday. Amid the slew of questions, one member of the audience raised his hand and asked Brisson if she had prepared anything for people with nut allergies. (The pastry was garnished with toasted walnuts). Brisson hesitated for a moment, before coming to the rescue by salvaging a plate of sausage she had set aside during her demonstration. She placed the meat on a clean plate and came down from the stage to serve it to the man herself. The generous act was met with great applause. 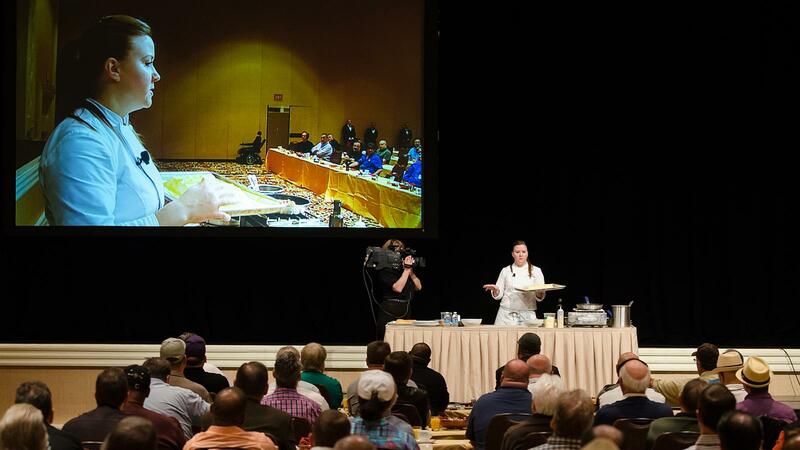 Satisfied with a full stomach, Big Smoke attendees returned to the main seminar room to culminate the event with a Roll Your Own seminar followed by a cigars and Bourbon tasting.